Lesson Learned – 365, 158, originally uploaded by Fluttering By. Okay, so today I was reminded what it means to have a toddler. More specifically a toddler that loves to climb. Oh and one that loves plants. The three kids seemed to all be enjoying Between the Lions this afternoon and I thought I could quickly sneak upstairs to upload my photos from our bike ride earlier. About 5 mins in I heard the water running. I originally thought nothing of it. The two older ones frequently use the facilities and wash their hands independently. I called down, thinking it was Molly, "Do you need help Molly?" Molly quickly replied "No." I responded "Don’t play in the sink! "… "Okay." Water shut off, all was good in the world. Ahem, well, you can see the picture. 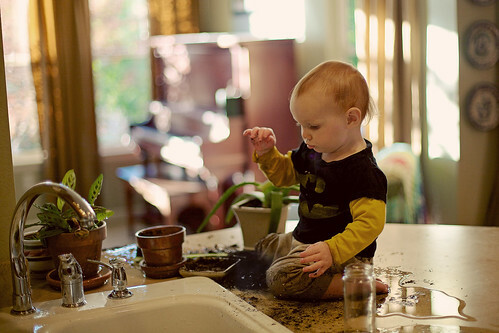 My mother has a similar photograph of toddler-hood adventures in the kitchen…except this one is of the kitchen floor, covered in a very fine, evenly distributed, coating of flour…and my brother holding the bag and more flour – much like your little fellows hand and that dirt. This made me laugh!